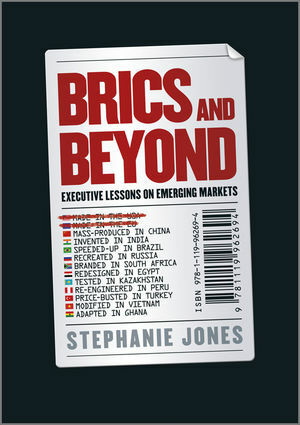 BRICs and Beyond is an international business executive text written especially for executive and MBA students. It is based on extensive consulting in emerging economies and several years of experience teaching executive MBA courses around the globe. The author has continually faced the problem that the available textbooks for teaching international business focused almost exclusively on examples of Western multinationals for case illustrations. In the process of preparing cases nearer to the emerging market she worked in, the author realized that the often fascinating, frequently insightful and always different approach to business illustrated by these cases should be required reading for MBA students in typical Western environments too. With its wide range of current case illustrations and concise summaries this is a new-generation text that will welcome today's MBA student to the wider world of 21st century international business. Dr Stephanie Jones is Associate Professor of Organizational Behavior at Maastricht School of Management (MSM), having graduated with a PhD from University College London, and a Bachelor’s degree from the London School of Economics. Dr Jones has authored over 25 full-length internationally-published books on business and management. Her most recent books include Nelson’s Way: Leadership Lessons from the Great Commander (Nicholas Brealey, 2005), textbooks for MSM on thesis writing, leadership and culture (Meyer & Meyer, 2007-9), Psychological Testing (Harriman House, 2010) and Leadership: Key Concepts (Sage, 2012). Previously a journalist and consultant, she has lived and worked in Hong Kong, China, India, Australia, Dubai and Kuwait. She teaches MBA students based across the world, in Asia, Africa, the Middle East, Eastern Europe and South America, especially courses on leadership, culture, corporate social responsibility and change management.